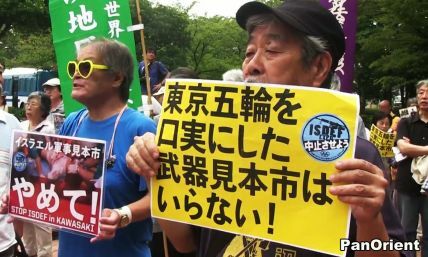 Tokyo- (PanOrient News) Japanese activists protested outside a trade show sponsored by Israeli defense and security technology companies this week in Japan’s Kanagawa Prefecture, near Tokyo. The show branded itself around the 2020 Tokyo Olympics and the anticipated need for higher security at the games. However, around 200 protestors disapproved of strengthening military ties with Israel, a country they see as violating human rights and by committing genocide against and testing its military products on Palestinians. The trade show, called ISDEF, was held in Kawasaki City on August 29 and 30. Although sponsored by private Israeli technology firms, the event was also supported by the Japanese government through its trading arm, the Japan External Trade Organization, or JETRO for short. More than 50 companies attended the trade show, including some from Canada and the U.S. Featured items included drones, anti-ballistic armor, cyber monitoring systems and security electric gates. Speakers at the event included the former director general of the Israeli National Cyber Security Authority and the Israeli ambassador to Japan. The former director general of the Japan Defense Agency also spoke. Japan is the second country outside of Israel to hold the trade show, following Russia in 2016. But some Japanese citizen groups denounced the decision of the government to allow the show to take place, and particularly blamed Kawasaki City and its mayor, Norihiko Fukuda. The main complaints of the protestors were Israel’s record of using military force against Palestinians and that the technology being showcased at the event had been developed for use against Palestinian protests in Gaza. Others said that boycotts against Israel are gaining traction internationally and that lending out public space for the trade show could cause diplomatic problems. 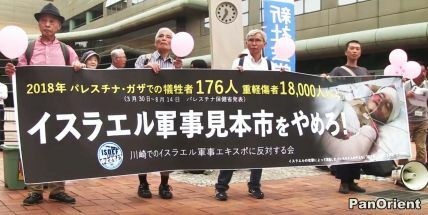 Two weeks before the event, a citizen group submitted a petition with 4,600 signatures to Kawasaki City asking that the city not rent out its public facilities for the use of the trade show. However, the mayor responded at a press conference by stating that the trade show was about security, so there was no reason to cancel it. Some critics assert that Prime Minister Shinzo Abe’s administration has strengthened ties with Israel in comparison with past administrations, citing the ISDEF trade show and increased investment in Israel as evidence. They suggest that the Olympics are serving as a convenient pretext as the conservative administration inches toward the normalization of military activities and arms dealings.